Winchester has a long history with it’s beloved short action rifles. They have stretched the limits of cartridges to an extreme amount while keeping the round chambered in a short action rifle. The 7mm WSM was Introduced in 2001 and developed as a partnership between Winchester and Browning it is a grandchild of Winchester’s .284 cartridge. 7mm WSM ammunition caught fire and became of the most famous Short Magnum cartridges from Winchester. The round is produced from numerous large scale ammunition manufacturing firms. 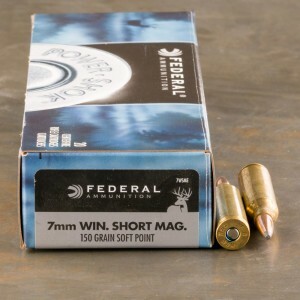 7mm WSM ammo is capable of pushing a 160 grain bullet at over 3,000 feet per second. The round produces excellent results on medium game up to 70 yards away. 7mm WSM ammo s capable of taking large and dangerous prey like black bear which has made the round popular with short range brush hunting. The 7mm Winchester Short Magnum’s popularity often comes from the fact it can be chambered in shorter, lightweight hunting rifles. 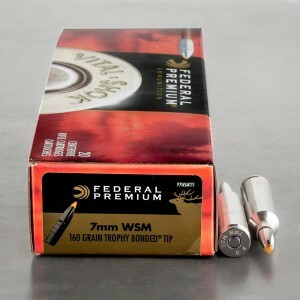 Check out our 7mm WSM ammo for sale below with everything you see in-stock and ready to ship. In my experience, this is a great round. I had one-shot kills with the 160gr TBT with my Browning A-bolt in Namibia and Mozambique on Waterbuck, Blesbok, Impala and Springbok. Shots ranged from 150 - 310 yards. Using it for Elk in October of this year. I bought this ammo for an elk trip to CO. I never did get a chance to use it, so as far as performance in the field, I don't know. At the range however it shot awesome out of my Browning X-Bolt. 1 1/2" groups at 200yds and less than 3 1/2" at 300yds, which is great for my shooting. Easily rang the 4" gong at 200yds.